Such is the pace of developments in London cycling infrastructure (planning if not actual execution) currently that a couple of details in my long blogpost of 11 days ago have already been superseded. The most striking one is that a plan has now been produced for taking the East-West Cycle Superhighway past Buckingham Palace in a sensible manner, with the support of the Royal Parks Authority. There will be, if this goes through, a two-way segregated track on the north and west sides of the Queen Victoria Memorial linking a new cycle track on the north side of Birdcage Walk (currently the most stupidly-designed road in the area, with masses of space wasted in the middle of it, with giant pedestrian islands and dead areas between) with a widened two-way track on the north side of Constitution Hill. The segregation around the Memorial will be with bollards, removable for ceremonial purposes, unlike on most of the Superhighway, where it is with kerbs. This all looks sensible enough, and people should respond to the consultation, supporting it, by 4 October. The question that is posed is: what was the problem before? Why was the Royal Parks Authority, until last week, bizarrely insisting there should be a gap in segregated the Cycle Superhighway in front of Buckingham Palace for 'safety, operational and aesthetic reasons', which would have caused, as Cyclists in the City pointed out, the Superhighway flow to get mixed with hundreds of gawping, snap-happy tourists on the Mall Service Road (effectively a pedestrian area, shown hatched just south of Green Park on the map above), obviously a recipe for disaster, and a position made even odder by the fact that, for the Superhighway solution in Hyde Park, the RPA was insisting that cyclists not share any of the current subdivided paths, but be routed via the roadway of South Carriage Drive. 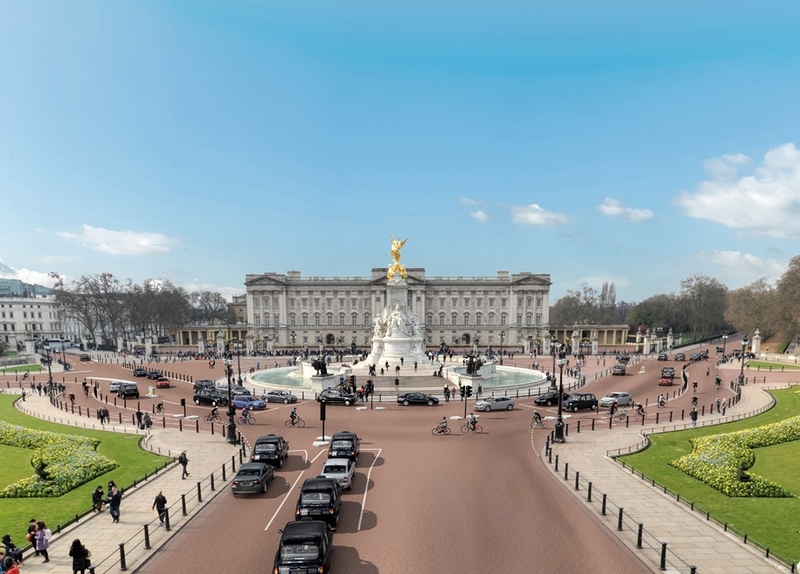 The appointment of a new chief executive at The Royal Parks, which is responsible for the roads around Buckingham Palace, has been key to resolving the dispute. Previous chief executive Linda Lennon was a fierce critic of many aspects of Transport for London’s 18-mile “Crossrail for cyclists” that passes through Hyde Park, Green Park and St James’s Park as it links Barking and Acton. The Royal Household is understood never to have objected to the plans. Mr Johnson said: “This is the final jigsaw piece in what will be one of the world’s great cycling routes. I am absolutely delighted that we and the Royal Parks have been able to reach agreement and I pay tribute to the agency’s new chief executive, Andrew Scattergood, his staff and TfL officers for the immense work they have put in to make it happen. So an anti-cycling Chief Executive left, and suddenly the 'safety, operational and aesthetic' objections all disappeared and the RPA was left looking rather less like the car-oriented dinosaur that campaigners had perceived it as before (the Royal Parks of course being full of roads that are full of cars, roads used as normal parts of the through-traffic system of London, with this fact not seeming to cause the RPA any distress or sense of conflict about their purpose). 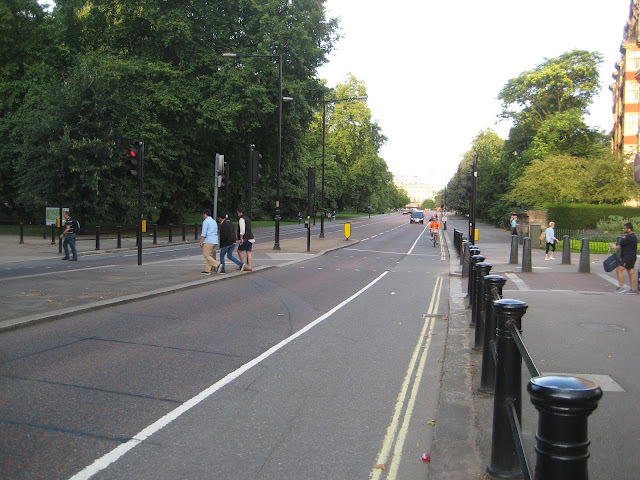 Hopes are raised that, after decades of campaigners asking for it, the Outer Circle of Regent's Park might cease to be a huge gyratory for motor traffic, but might be changed so as to allow only motor access to the car parking, the zoo and residences, and to facilitate a much-needed north-westbound Cycle Superhighway, CS11. So my message here is that often, despite outward appearances of implacable homogeneity of institutional opposition to progressive schemes, it can often turn out to be only one badly-placed person, in reality, who is causing the problem. On the flip side, one well-placed progressive person can often galvanise an organisation and create more progress in a short time than has been achieved for many years. And I have to hand it to Cllr Phil Jones, Camden's Cabinet Member for Transport that he has, with the assistance of his officers, got Camden making better progress on actually implementing a Central London Cycling Grid (to complement the small number of built Superhighways) than all the other boroughs combined. 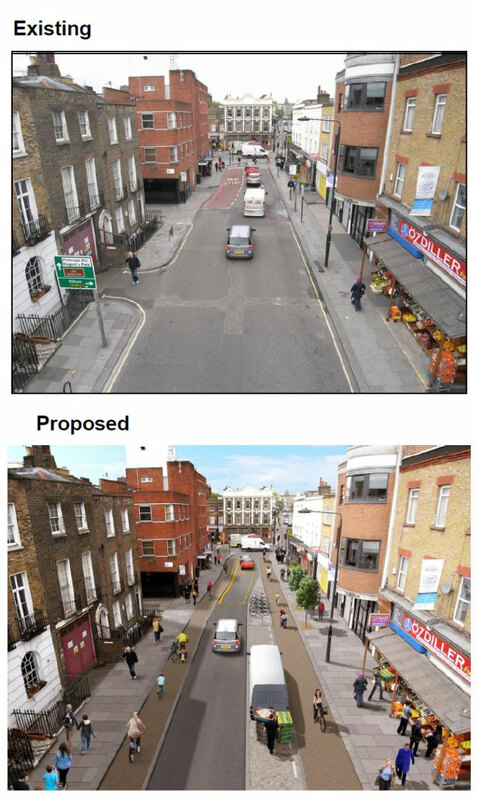 I reported in my last post that the promised link between Royal College Street and Primrose Hill was currently stymied by bus-related arguments, but apparently these have been overcome, and Camden is now produced an attractive plan for consultation, which I recommend all London cyclists respond to favourably as well. 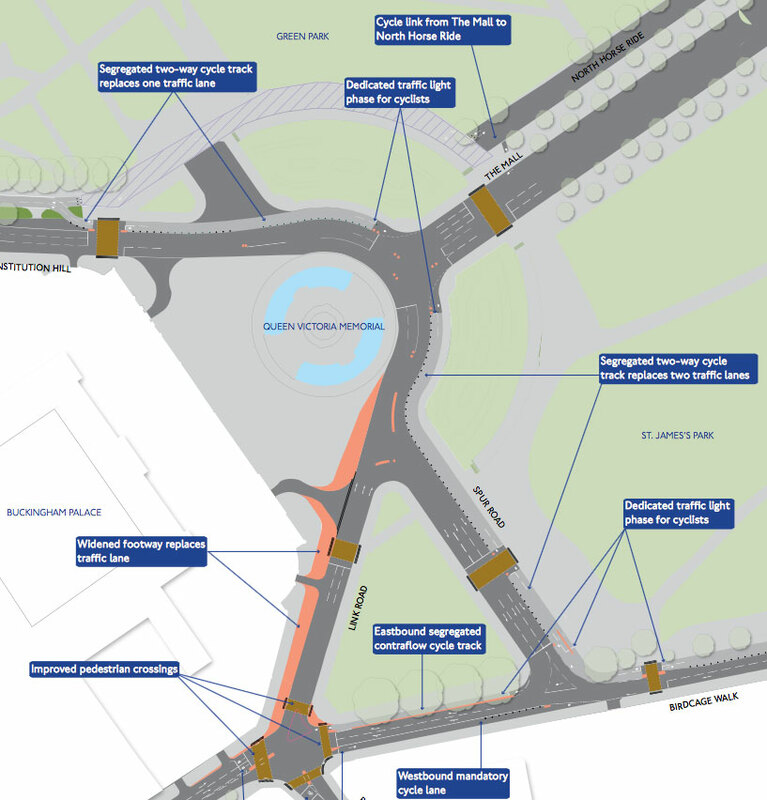 Once the links are complete, cyclists will be able to ride from Swiss Cottage and Camden Town to Canary Wharf, Barking or Elephant & Castle entirely on separated cycle tracks or low-traffic streets. It’s testimony to the power of the relationship between TfL and a borough genuinely committed to cycling. Actually he could go go further. If the Mayor actually builds CS11, promised for 2016, it will be possible to go all the way from Brent Cross to Canary Wharf, Barking or Elephant & Castle on cycle tracks and low-traffic streets. So I congratulate Cllr Jones on getting his plans this far, though I have disagreed with him on the best solution for Tottenham Court Road and Gower Street, Camden's 'West End Project'. Drawing lines on maps, declaring them cycle routes and investing heavily along the route seems to capture the imagination of cycle planners and some campaigners, even though hardly anyone cycles such a route from end to end. Some of the investment that comes from such route-based planning will be good cycling value for money. However, instead of spending all this money on CS1, there are numerous other locations in the borough where investment would have been better directed. Improving these other locations, rather than using a large pot to titivate, and not substantially make things better for people cycling would certainly be better value for money, in terms of improvements to cycling. 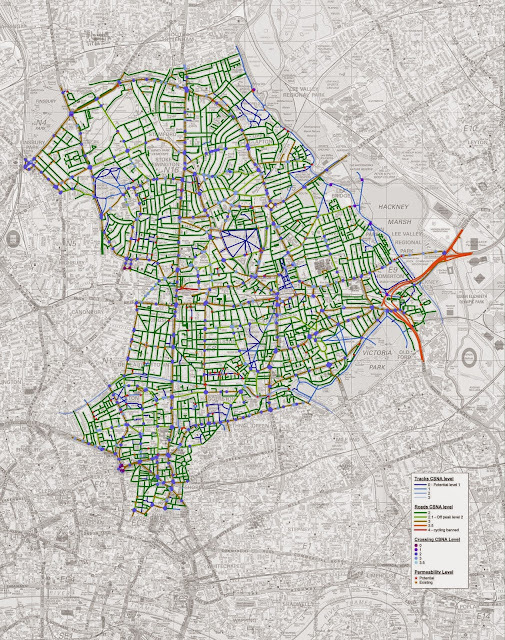 In Hackney, in contrast to the route-based approach, the most innovative recent work has been the creation of a Bikeability map which assesses all of the borough's streets, regarding them as a network. Incrementally improving this network, particularly where there are historic clusters of collisions, will provide the best value for limited cycle and road safety funding. Sometimes improvements may be made opportunistically. Hackney's 'Bikeability map'. The green on minor roads represents a lower 'Bikeability skill level' than the grey-brown on (e.g) the A10 running straight N-S down the west side of the borough. will be regarded with some very raised eyebrows in the borough and beyond. Of course I'd not dispute that streets should be regarded as a network, and, ultimately, almost the whole network needs its quality raised for cycling, but the points that are missing from Stops' analysis are 'utility' and 'standards'. Some routes are of far more utility and importance to cyclists than others, and it is here that investment at this early stage in developing a cycle network must be concentrated, to develop what I'd describe as the 'backbone network' of obviously attractive and useful routes that is needed to pull people in to cycling. Generally, but not always, these routes will be on the main roads, where, to achieve acceptable standards of actual and subjective safety, cyclists need segregation. Stops wishes to focus on the wider network, and implicitly, to focus on small roads, because he seems to have a horror of the idea of subdividing the space on larger roads using kerbs, which he considers to be 'pesky' things that will disadvantage pedestrians, bus passengers, or others. But the 'Bikeability map' approach that Stops praises is fundamentally discriminatory and opposed to inclusive cycling, because it accepts a general and permanent compromise between efficiency and safety that is inimical to creating to a quality cycle network with uniform provision. What this 'Bikeability' thing, in this context, is really about is classifying cyclists, not roads. The very concept of 'Bikeability' in play here is a motor-oriented one, confusing 'cycling skill' with 'willingness to cycle with motor traffic'. Brave 'skilled' cyclists (normally young men) will continue to push their way down the A10, with its bad crash rate, because it is the most efficient, useful route for them. The slow and less assertive will, if they try to cycle at all, which most of them will not, be consigned to an indirect, low-priority, hidden 'superquietway' that will not be easy to use and will not get them to the places they need to go. This is not a good approach if your aim is mass cycling. But I sense this may not be Stops', or Hackney Council's, real aim. 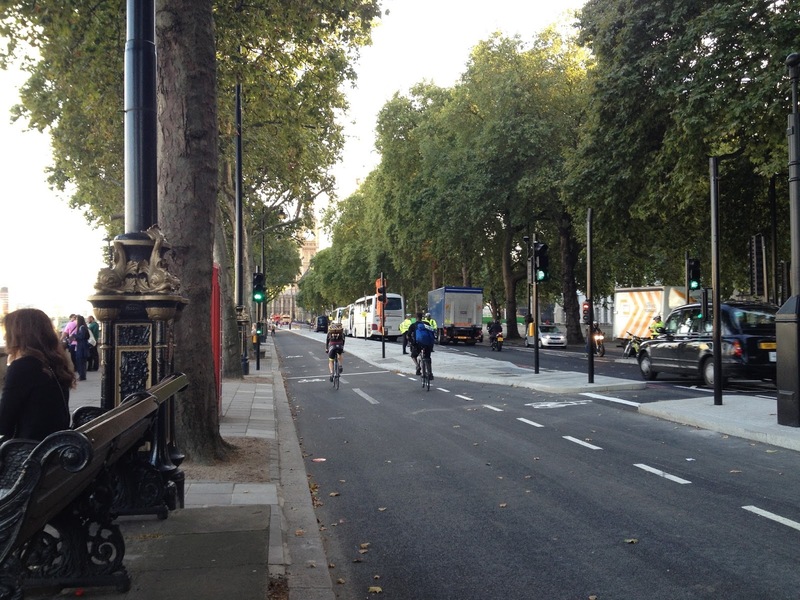 How will an 8 year old get through a more congested Parliament Square as a non CSH route user? 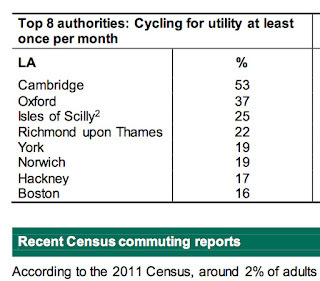 Stops likes to claim that Hackney is London's best borough for cycling. I'm sorry, but the truth is that cycling in Hackney is, by and large, crap. I've often cycled in Hackney, and I cycled through Hackney the other day. There is no provision on main roads, which are choked with buses and other heavy vehicles, and the minor road routes are slow, deprioritised, badly-maintained and uncomfortable. You are bumping over severe traffic-calming all the time, and badly-maintained surfaces, taking long ways round, trying to follow neglected or non-existent signage in obscure places, you are constantly having to give way to main roads, or even slightly more important roads, and where you meet a main road to negotiate a straight across or dog-leg junction you have no help and no protection. Hackney can't even can't keep these poor backstreet routes open. The famous one running east-west from Canonbury to London Fields is currently blocked by major digging where the railway goes over in Middleton road, and cyclists just have to use the pavement. Cycling in Hackney is inefficient and dangerous on the backstreet routes that borough provides, and very dangerous on the direct main road routes that it does nothing to make attractive or comfortable. Contrary to Stops' frequent claim that Hackney is some sort of great cycling leader amongst London boroughs, it actually (according to TfL cycle counts) has a similar cycling level to the boroughs of Richmond upon Thames, Hounslow, Islington and Lambeth, places with very different local circumstance and policies. 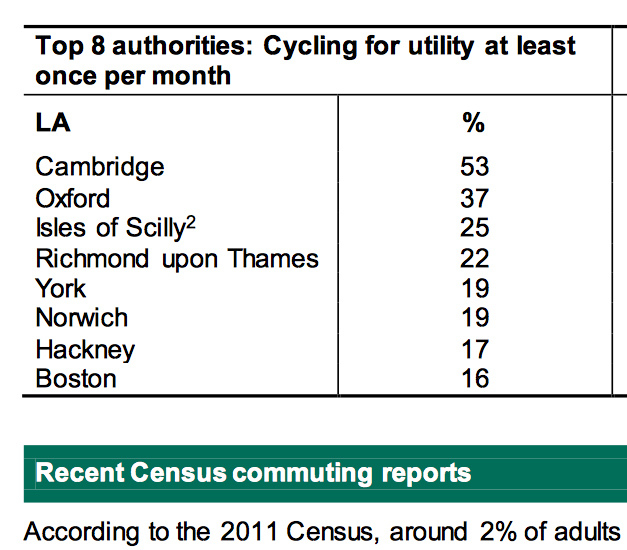 The 2011 census gives utility cycling actually at a higher level in Richmond upon Thames than in Hackney (though I don't put much store by census transport data, as it comes from a self-survey, and may just mean that Richmond people want to believe they cycle more than Hackneyites do). Richmond and Hackney are very different places, the former outer London and Conservative-controlled, the latter inner London and Labour, but I think the reasons for the high (by very low UK standards) cycling levels they share are a result of similar factors. Both have within them or very close to their borders a lot of parkland and waterside space where cycling is possible, attractive and car-free (in Richmond Park and other parks and along the Thames in the case of Richmond and in Victoria Park and other parks and and along the canals in the case of Hackney). In neither case is this much to do with the roads policies of the council. Hackney is, in addition, a flat and compact borough within easy commuting distance of the City of London, and it does seem that Hackney does disproportionally well out of commuting to the centre (it is the commuting mode share that the proponents of Hackney's 'cycling success' usually quote), while cycling to school remains at only 2% of trips, not high even by UK standards, and indicating the lack of a genuinely broad-based cycling culture. Cllr Stops' partner Rita Krishna, is strangely (or not so strangely, if you know the local situation) on the Committee of Hackney Cycling Campaign. Since she appears to share the same views as Stops, those Hackney cyclists wishing to campaign for good-quality infrastructure in their borough had best lend their support to the rival campaign, Hackney People on Bikes, which does support the policies promoted in this blog (which are also the official policies of the London Cycling Campaign). In any case, it looks like Hackney will continue to be a blockage to the development of a high-quality, inclusive cycle network for Londoners while Vincent Stops remains influential on the borough's transport policy. 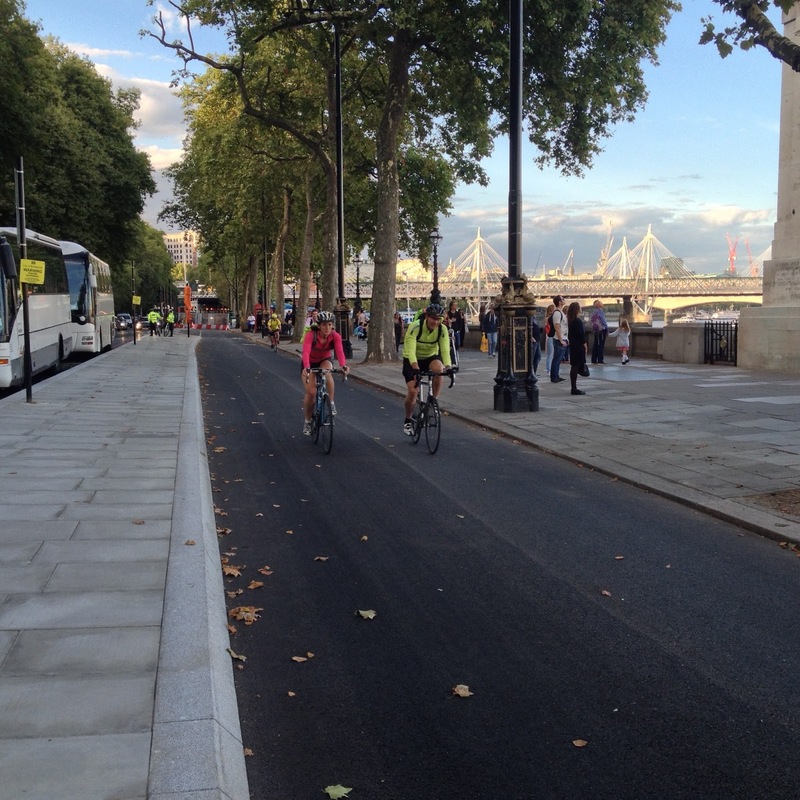 I paid a visit to the Embankment on Friday to see how the East-West Superhighway construction is getting on (and to examine those pesky kerbs). Only a 500m section is currently open, between Horseguards Avenue and Westminster Bridge, and it is only accessible to westbound (or southbound) cyclists, as there is no way to reach it eastbound. However, looking at the rest of the work on the two kilometre section between the open section and Blackfriars Bridge, I expect all this length to be open by the end of the year. Completed Superhighway section looking south (up river). The basic two-way track is 4m wide in general. The track is smooth, machine-laid tarmac. The kerb on the river side has not been altered, though I think it has been made lower by laying of the track. The kerb on the new segregating island is chamfered, a good detail, allowing wider effective width and reducing the chance of pedal-strike. Make no mistake, this is the proper thing, and very satisfying to see, as the first piece of truly high-quality cycle infrastructure ever built on a main road in Central London. This is the most significant thing done for cycling in London since Camden built its tracks at the turn of the century, and, before that, well perhaps the most significant infrastructure put in since the 1930s (though that was suburban, not central). It's worth re-emphasising here: this is a gain from road-space. Nothing has been lost by pedestrians (in fact a lot has been gained). A simple transfer has taken place from space dominated and, from the point of view of most people, monopolised by motor vehicles to space dedicated to active travel. We'll see a lot more of this with the rest of this Superhighway scheme, and the north-south one from Elephant and Castle to the border of Camden. The politicians and public servants, like Vincent Stops and Linda Lennon, who say they support cycling, but do not want to see this kind of thing on their patch, will in future be seen more and more as an anachronism and an impediment to the development of a more civilised, pleasant and sustainable city. The new Superhighways and Camden's grid routes point the way to a future pattern of use of road space that gives everybody an opportunity to cycle their journeys if they wish. The discriminatory approach based on keeping direct main routes as the cycling preserve of a tiny fit and brave minority must be consigned to the dustbin of history. I left a comment on Vincent's blog but, as it didn't agree with his opinion, he didn't allow it to be posted. I can't say I understand his assertion that Hackney's approach is 'network based'. Since a network of roads is just a interconnected system of roads it would seem to me the only way of improving a network is improving the routes themselves. Anyway, I intended to do an analysis on the proposed solution a few months ago, but never got round to it. 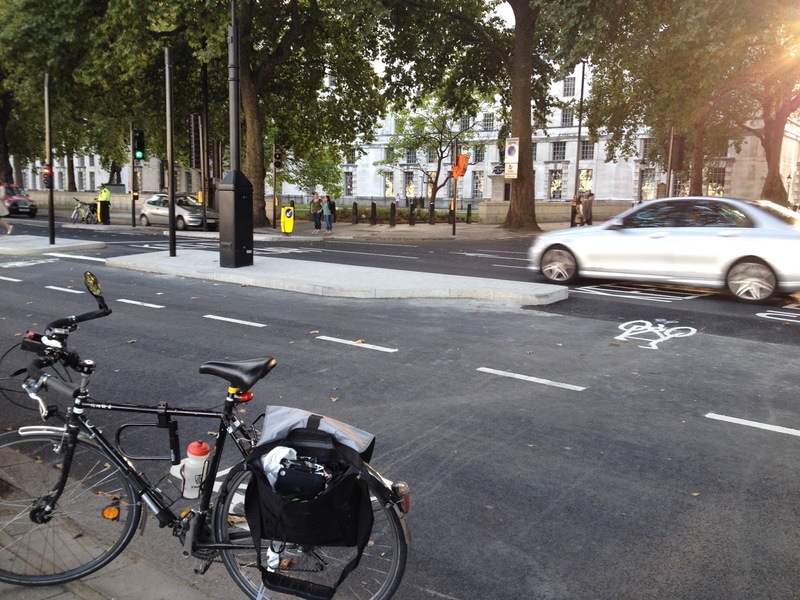 Here are videos showing the cycle along the A10 and the CS1 route. The latter took two attempts as I got lost and didn't have the time to back track (but I'm sure the signage will be excellent when this is finally rolled out). About hierarchies, is there one that includes disabled people, including tricyclists? On technical matters, what are the minimum widths of various features? What cambers are being used? How does a disabled cyclist use crossing controls, why do not car drivers get out of their vehicles to push buttons to change signals? Why are there delays before they change, how fast is someone expected to walk across a road and is that reasonable for an older or disabled person? Do they feel threatened crossing roads because of lack of time? How long does it take for a disabled person to get from one side to another of a complex busy junction? If there are principles designers need to be continually reminded to justify all their thinking. The devil is in the details! Another problem with VS' opposition to a route based approach is that routes catering for the lower ability levels simply don't exist, and there's no impetus to create them. Remove all the links and junctions on the above map requiring anything higher than Bikeability 2, and route choice becomes drastically limited. In particular, the east/west running main roads sever the vast majority of potential north/south links. Failure to focus on routes means this problem is swept aside, instead of being recognised as a critical barrier (one which can only realistically be solved by segregated lanes on at least some segments of those main roads - so it's not surprising he wants to ignore it).